Rafael Soldi: Hi Jonathan, thanks for chatting with us! Jonathan Mark Jackson: Hello Rafael, thank you for this opportunity! RS: I'd love to chat about your project The House Servant's Directory, which is inspired by a book by the same name, written by Robert Roberts. Tell us about the book and about Roberts, why were you drawn to him and his book? JMJ: The House Servants Directory was originally published in 1827, as Robert Roberts was finishing his brief tenure as a butler at the home of Massachusetts lawyer Christopher Gore. Roberts was a free man living in Boston, and had previously worked as a butler for Nathan Appleton, and it is believed that he traveled abroad with Appleton to England and France. The House Servants Directory was the first commercially published book written by an African American, and later was reprinted in two editions as the book gained popularity. The book is split into two halves: In the first half Roberts narrates the lessons he’s learned to two younger men that will be entering household service, in these chapters he dictates not only the methods in which domestics should perform their work, but also the mentality and behavior both servants and employers should seek to have in the home. The second half is a reference list of 105 recipes, tips, and tricks that involve keeping a good home; this list ranges from delicious Lemonade recipes, to concocting hair dyeing pigment, and producing restorative liquids for garments and wood. The books legacy is kept alive by Gore Place, now a historically preserved landmark and museum. Through archival genealogy work done by my Great Aunt Christine, who lives in Providence, and my late Grandfather. It was revealed to me and our family that Roberts is one of our paternal ancestors. By the books, he is my fifth Great Grandfather. I was drawn in to producing a body of work around The House Servants Directory first through this ancestral connection, as I had a very limited knowledge of my ancestral history within the United States. As I began to read the text though, I was inspired by his language and prescription. I thought that engaging with this text, and with Gore Place, would bring on a necessary evolution from my previous internally driven self-portrait work. My working methods before always placed the figure – my body – into a void like space where identifiers could be clearly added or subtracted. I wanted to get out of this void and into the world to relearn much of the history I knew of photography, my family and New England. RS: What was your first step once you made these discoveries and decided to work with the subject? JMJ: I first sought to read the text thoroughly and see the site. After returning to Amherst in the Summer of 2018, from Yale Norfolk Summer School Residency, I went on an initial site visit to the home. Soon after that initial visit I sent in a formal proposal, along with the archival work done by my Aunt, to the director of the museum and the staff. We had an initial meeting to discuss what I wanted to pursue, and from there I began visiting the home on a weekly basis to make photographs. RS: So you began making trips up to the house with frequency, and interacting with the spaces and objects around you. Gesture seems very important, and the way your body dovetails with the space seems equally paramount. Are these choices playful, intentional, or both? JMJ: Definitely both! As I have continued to photograph and internalize the space – its architecture and light – I have tried to become more specific with my actions when my body appears in the images. When I appear, I feel that there is always a sense of discovery in how the space frames the body. In many of the images I am simply stopped, held in place and framed either by light or the homes unique architecture. I should note that, in my conception of the photographs, there are no images where I actually depict an action of service. Rather, they become moments of isolated pondering. Even as I have tried to become more specific in my emotional and bodily performance, when I go into the work to edit, I always look for unseen opportunities that can manifest from mistakes during the making. Light haze, movement, unintentional cropping, and underexposure have always led me to discover more than what I had planned. RS: As you channel your linkage to Robert Roberts, how do you conflate the idea of becoming a vessel for the identities of our ancestors? Do you question how we carry them? JMJ: I have been thinking a lot about what it means to become a vessel, or a human archive, within this project. I think this work receives its energy from the collapsing or spiraling of time between Roberts and myself. Within my previous and current course work, I have begun thinking about what it means for a work to activate the ancient present tense and situate a viewer in multiple timelines. The courses that have specifically shaped my thinking around this phrase were Measuring Histories, Through Materiality and Multiples, taught by artist and now Amherst Professor Sonya Clark, and a course titled American Origins taught by Amherst Professor Lisa Brooks. What relationships of time are formed once the photograph taken? How many generations of lives are archived in the production of these images? As I work and move within the spaces he lived and worked, I do begin to have both physical and metaphysical questions about his life: What did he look like? What was the pitch of his voice? Which hand did he write with? What was his attitude towards the political actions of the commonwealth of Massachusetts, and looming over that, the actions taking place in the southern Confederate states? Sometimes, I simply wonder if he found beauty and magic in similar objects, or areas in the home, that I do? This project has also brought on a dramatic emotional shift in my understanding of myself. To move from carrying a broadly generalized Black American history to one that is hyper-specific, named, and documented has changed my day to day interactions with myself and New England. If I am a vessel or carrier of history, the most important question that has arisen in this work is: What versions of history have I been made open and closed to? RS: Tell me about the uniform you've chosen to wear in your images. What role does it play on a formal level and how does it represents multiple layers of identity? MJM: In all of my self-portrait work before, I have styled myself with a uniform that helps me to separate methods of making and thinking between projects. As I started this work, I knew that whatever the uniform became would be massively important. I briefly considered and experimented with styling myself in period clothing, taking notes from Roberts own description of what he would’ve worn, but I felt that the identity of the figure in the images became too trapped in a known stereotype or definition. I later decided to make a uniform of contemporary clothing that could blend or disappear into the space of home tonally. In addition to this, the white gloves that I have chosen to wear give a nod to the action of service, and cause the identity of the present figure to fluctuate between being an artist in the space, a curator, an archivist, a domestic, and a performer—a magician. RS: Beyond photographs, how else are you exploring this relationship? MJM: There has been written language that has served as an undercurrent to the project. This work includes letters that I have written to Roberts, as well to other known ancestors, and written pieces that attempt to narrate some of Roberts possible thoughts and feelings. I have also extended the project into my other course work at Amherst and have produced short videos, sound pieces, and installations. The installation work functioned as an experiment to create an “office” of multigenerational use. 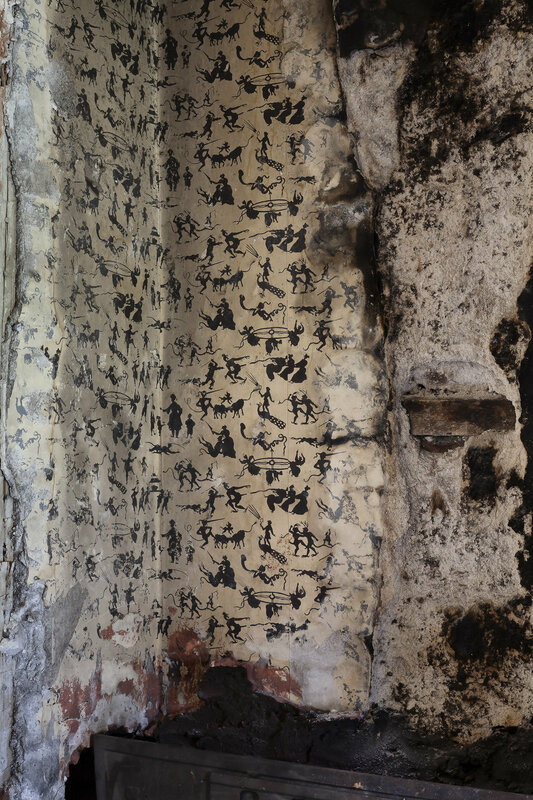 I combined photographic imagery with my research texts, and produced projected videos that inhabited objects and doorways. Whenever I present the work, I try to mimic standard academic research by combining primary, secondary, tertiary sources of information. RS: What kind of conversations and collaboration are you having with the staff and caretakers of Gore Place? Has your arrival sparked any interest in looking at the home's history differently? MJM: I hope that the photographs have offered the staff new insights into the curation of the space. Many of the images begin to function as a double archive, as they capture the changes in some installed scenes and moments in the house over time. As I have presented more photographs to the staff, I have become interested in that wordless collaboration that happens. I am always interested in what the photographs bring to life in the space. Before I even made my first appearance, the staff at Gore Place were working to structure an entire year around retooling the information that is known about Robert Roberts. Now that I am involved, we are hoping to build a new audio and visual tour that circulates around Roberts and the home. Gore Place is also looking forward to publishing a new edition of The House Servants Directory, which will include a detailed forward addressing the recent discoveries made around Roberts. Our goal of this collaboration is to expand the knowledge of Roberts to a much wider audience. Through him, and his work, we can gain a fuller understanding of early American history. RS: What's next? Where can we see your work? 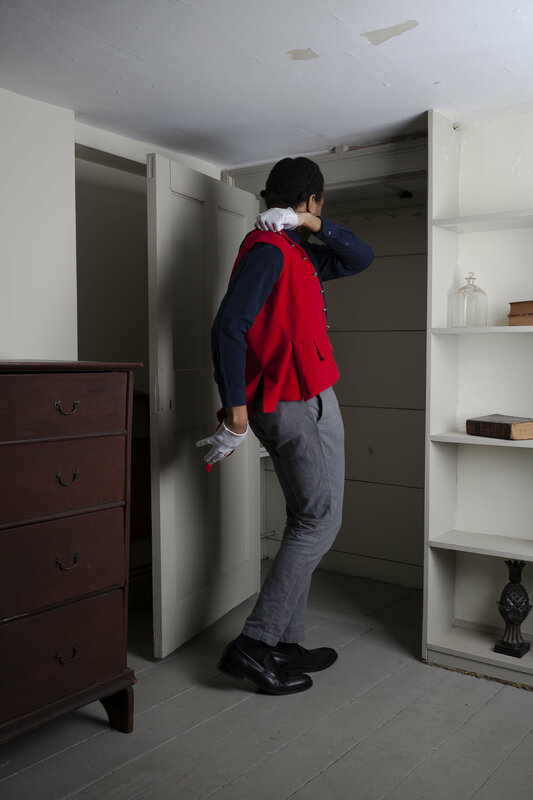 MJM: The first phase of The House Servants Directory project will be exhibited at the Eli Marsh Gallery at Amherst College, from April 22nd to May 26th, 2019. This will be a three-person group show, with space shared between myself and my thesis-mates, Joanna Booth and Mika Obayashi. From there I would encourage anyone interested in the work to keep an eye on my social media and website, as well as Gore Place’s website and Instagram (@goreplace), as we work to bring the project either to the home or to venues within Boston for exhibition!